With Labor Day behind us, summer is unofficially over. It is still very hot here in Dallas, 103 F today, so forgive me if I am not ready to break into my fall comfort food recipes just quite yet. Peaches, for example, are still available at the farmer’s market and as long as they are still available I can’t pass the up. Soon, you see, they will be gone and the end of peach season is one of the saddest things about the end of summer. I got some very, very sweet peaches on my last shopping trip that I wanted to use in one last peachy recipe this year. 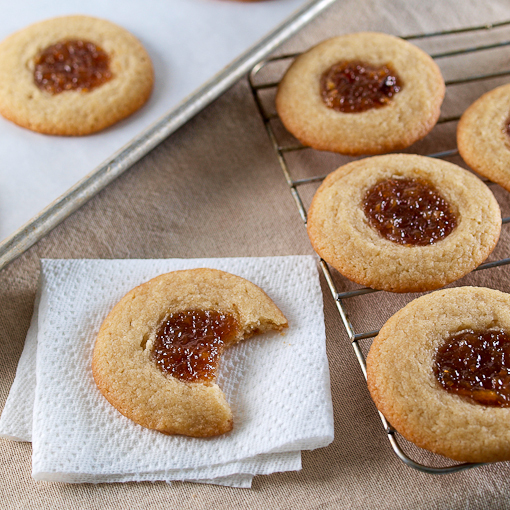 I intended for these to be traditional thumb print cookies, because I wanted to showcase my caramel peach jam, but they spread – a lot! 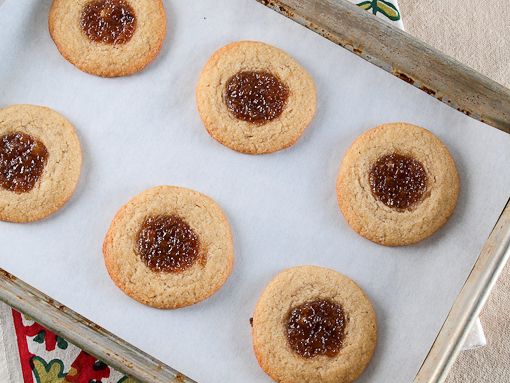 Instead these cookies are crisp and buttery with a peachy center. They are not exactly what I wanted, but one taste is all it took to know these were better than what I wanted! I love it when that happens! 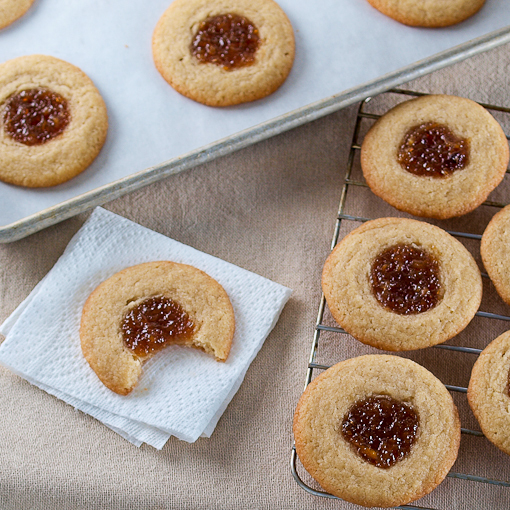 The cookie part of this recipe was intended to be a vehicle for my caramel peach jam, but the cookie part surprised me by being as good, if not slightly better, than my excellent jam. So, let’s start with the cookie. It is very buttery, crisp at the edges and chewy in the center thanks to the jam. There is no leavening agent in the cookies but they are in no way heavy. They would be lovely without the jam, but you would be missing out. 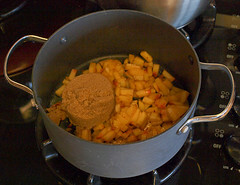 That leads us to the jam which is made with brown sugar, a hint of spice, and cooked until it is VERY thick. You have to cook out the water from the peaches, so it takes a good 20 minutes once the mixture reaches a rolling boil to be just right. 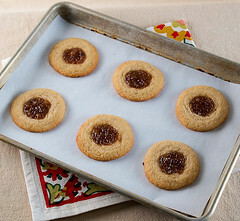 By cooking it until it is super thick you get a sticky, deeply caramel flavored jam that holds up well when baked into a cookie. This jam would also be good on toast, over ice cream, or eaten off a spoon – just saying. In a medium pot combine the peaches, brown sugar, vanilla bean paste, lemon juice, cinnamon, and salt. Stir to combine then cook over medium-high heat until it reaches a rolling boil, about 3 minutes. Once boiling reduce the heat to medium and cook, stirring occasionally, until the mixture is very thick and a deep caramel color, about 20 to 25 minutes. 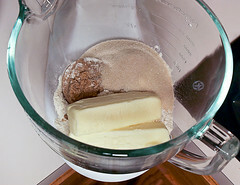 Remove from the heat and cool slightly, then transfer the mixture to a blender and pulse until the mixture is roughly blended. Do not puree. Set aside to cool to room temperature. 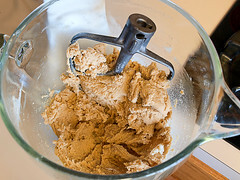 In the work bowl of a stand mixer combine the flour, butter, brown sugar, sugar, and salt. Beat on low speed until the mixture clumps around the paddle, about 1 minute. Add the milk, bourbon, and vanilla and mix on low speed until the mixture is smooth, about 1 minute. 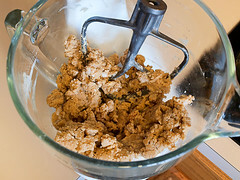 Scoop the dough into 1-inch balls, then press your thumb or a teaspoon, into the center of the cookies. 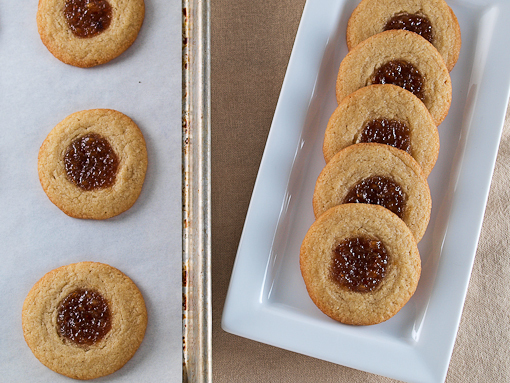 Fill the center of each cookie with 1/2 teaspoon of jam, spreading it gently so it is in an even layer. 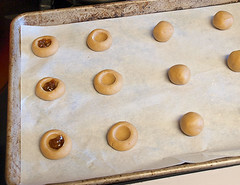 Bake for 10 to 12 minutes, or until the cookies are golden brown at the edges. Cool on the pan 5 minutes, then transfer to a wire rack to cool completely.